The nature of Muslim knowledge concerning the West through travel accounts makes for fascinating reading, With Syed Ahmed, begins an entirely new phase with his interplay between Muslims and the West, on the one hand, and between Islam and Christianity, on the other. Even though his portrait of England is sometimes facile, his account opens the door to new questions, particularly because the relations between Europeans and Indians were at the centre of many debates. Consequently, passages in the Musafiran-i Landan introducing ‘Europe’ and ‘England’ are historically important enough to merit attention, since they are not used merely as fulsome descriptions of Western society’s advances, but also contain the germ of the justification for an Anglo-Muslim rapprochement. This makes the Musafirna-i Landan an important source for the construction of the history of an era. Its English translation, the first ever to be undertaken in full, makes it accessible to those who have no knowledge of Urdu. Although several accounts of ‘India and the West’ are available, A Voyage to Modernism is of special significance. 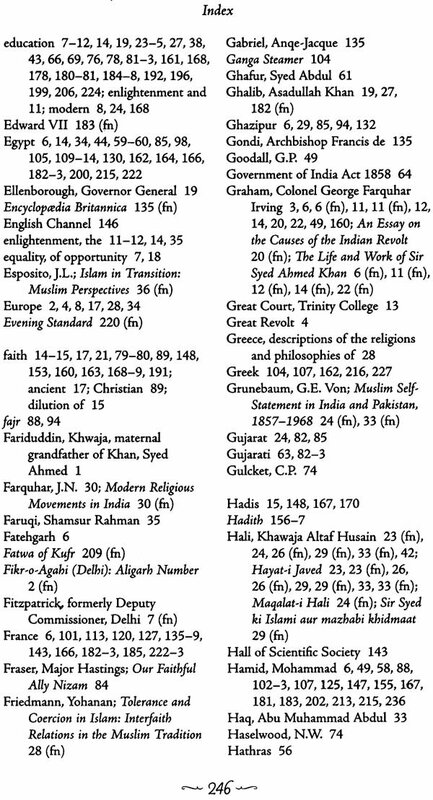 Set apart from his later endeavours like the Tahzibul Akhlaq and Asar-al Sanadid, it is the Syed’s impressions caught in A Voyage to Modernism that mattered to all those who knew anything about his standing in public life and his stature as an enlightened reformer in the last quarter of the nineteenth century. This eminently readable translation is enriched by editorial interventions by translators and editors of the work, and supported by rare archival photographs. Professor Mushirul Hasan is currently the Director General of the National Archives of India, New Delhi. He has edited the travelogues of Mirza Abu Taleb Khan, Lutfullah and Munshi Ihtisamuddin. Professor Hasan has also co-edited Journey to the Holy Land: A Pilgrim’s Diary. Dr Nishat Zaidi is Associate Professor, Department of English, Jamia Millia Islamia. A translator and critic, she focuses on Indian Literature in English Translation. 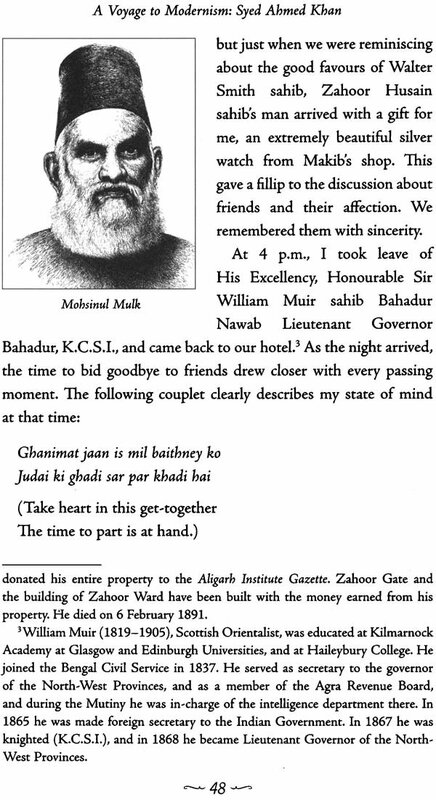 SYED AHMED KHAN (1817-98) was born in Delhi on 17 October 1817. His ancestors, including his father and uncle, had held important positions at the Mughal court in Delhi. His maternal grandfather, Khwaja Fariduddin (1742-1828), represented Wellesley, the Governor-General of India (1797-1805), in the court of the Shah of Iran and was later made Prime Minister of Akbar Shah II in 1815. 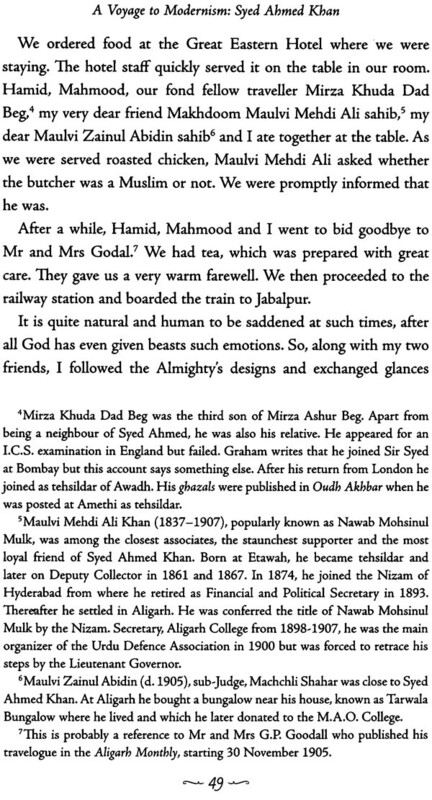 Syed Ahmed himself was often the chief link between Mughal society and the rising colonial power. While promoting the better aspects of a dying past, he also desired to build something new and something better from its rubble. He had clearly a vision of construction—a passion to build through the wreckage of the Mughal Empire a grand Anglo-Muslim alliance. He gave eloquent expression to his dream of a renewal during the seventeen months he spent in England in 1869-70. Clearly, no man capable of such a vision could be dismissed as naive, and yet Syed Ahmed invited condemnation—moderate by his detractors and violent by the theologians, mostly of the Hanafi school. He was declared to be guilty of being a Nechari (Urduized form of Naturist). In an attempt to defy the materialism of the West, its regimentation and drive towards conformity, words like heretic, apostate, or atheist were used to describe those whose views were considered destructive and disastrous in the light of the Koran. Syed Ahemd, too, was tarred by the same invidious brush in the name of the Koran and the Hadis. There was opposition to his travel to England as well. The grandeur, the lion-like strength, the high ideals, the passionate enthusiasm, of a great mind. 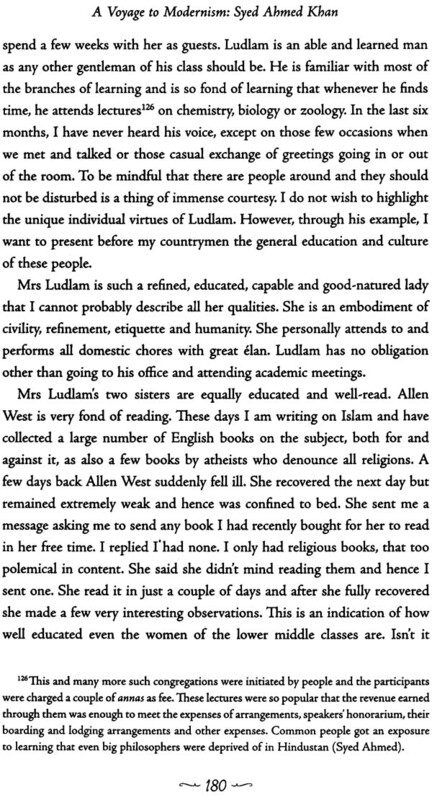 No Musalman, whom I ever met, impressed me more by the force and dignity of his character and his commanding intellectual greatness than Sir Syed Ahmed. Wherever he went, he naturally took the lead. His personality demanded it, and men instinctively followed him. His very presence and appearance were commanding. He was a born leader of men. 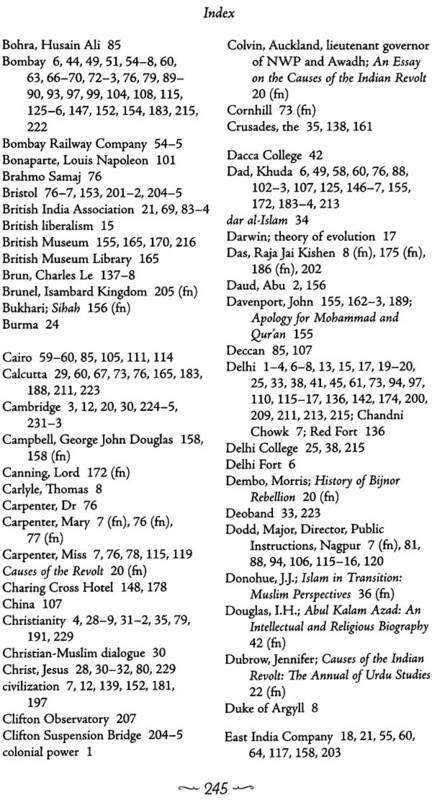 Historians have, of course, contradictory views on Syed Ahmed’s intellectual and cultural placement. Scholars from Pakistan venerate him for providing a raison detre to the two- nation theory, whereas he is spurned in certain quarters in India, for his outcry against the Indian National Congress. 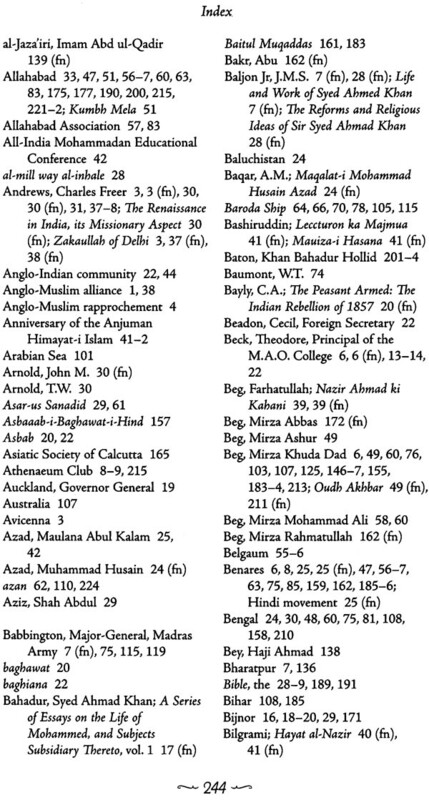 But in most scholarly writings (emanating, incidentally, from the West and not from the Aligarh Muslim University) Syed Ahmed stands out as a principled, conscientious individual who epitomizes both, the promise and perils of the new colonial modernity. 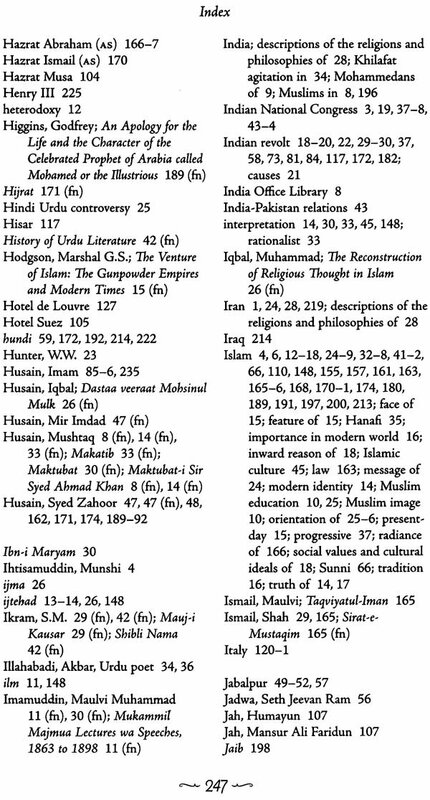 Moreover, the Muslim intelligentsia is increasingly beginning to see itself as the legitimate trustee of an intellectual development which absorbed not only Islamic/Muslim thought, but also the essence of Western rationalism. Consequently, the historiography of the Aligarh Movement is now being viewed in a spirit of praise rather than blame, of appropriation rather than rejection. 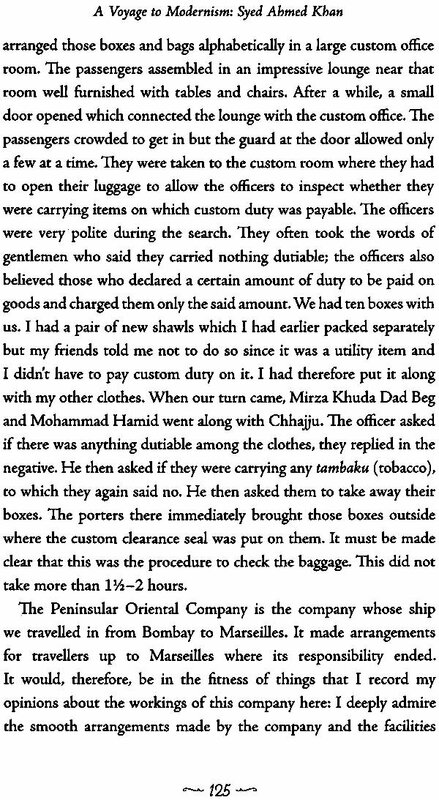 In an earlier account Mushirul Hasan has already examined the nature of Muslim knowledge concerning the West through the travel accounts of Munshi Ihtisamuddin, who visited England in 1765; Mirza Abu Taleb Khan (1752-1806), who spent four years from 1799 to 1803 in Europe; and Lutfullah (b. 1802), who wrote in the year of the Great Revolt. 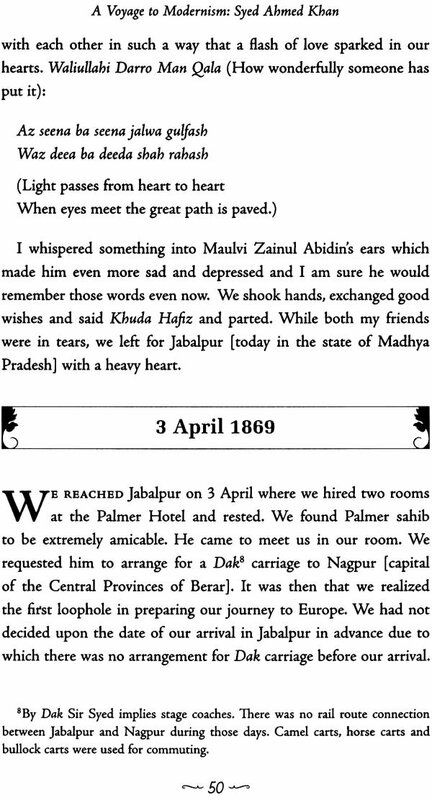 Their encounters were embedded in their travels which, at the time but not now, seemed far away and less urgent. With Syed Ahmed, however, begins an entirely new phase of interplay between Muslims and the West, on the one hand, and between Islam and Christianity, on the other hand. 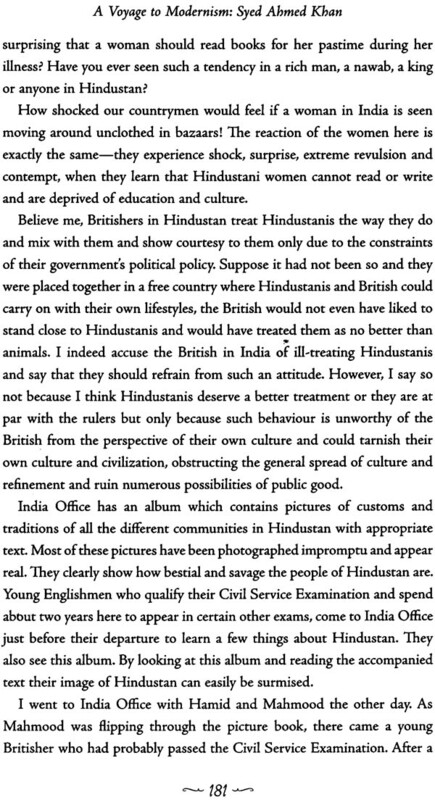 Even though his portrait of England is sometimes facile, his account of travels opens the door to new questions, particularly because this was the period when the relation between Europeans and Indians were at the centre of many debates. The passages introducing ‘Europe’ and ‘England’ are historically important enough to merit attention, since they are not used merely in a socially positive sense but also contain the germ of the justification for an Anglo-Muslim rapprochement. 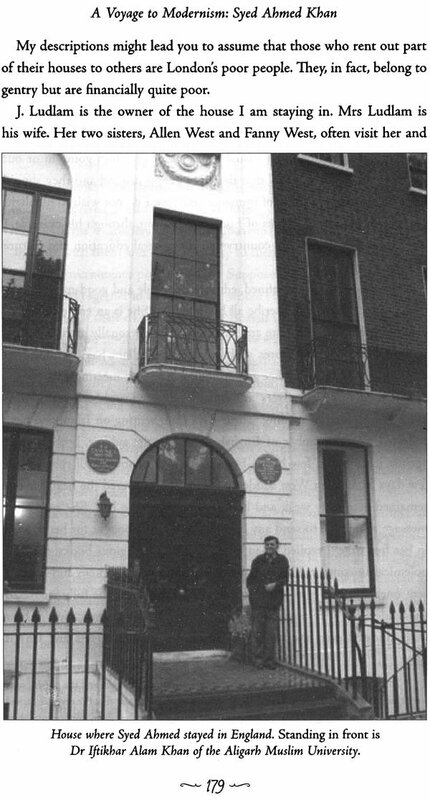 This makes the Musafiran-i Landan an important source for constructing the history of an era. This English translation, the first ever to be undertaken in full, makes it accessible to those who have no knowledge of Urdu. 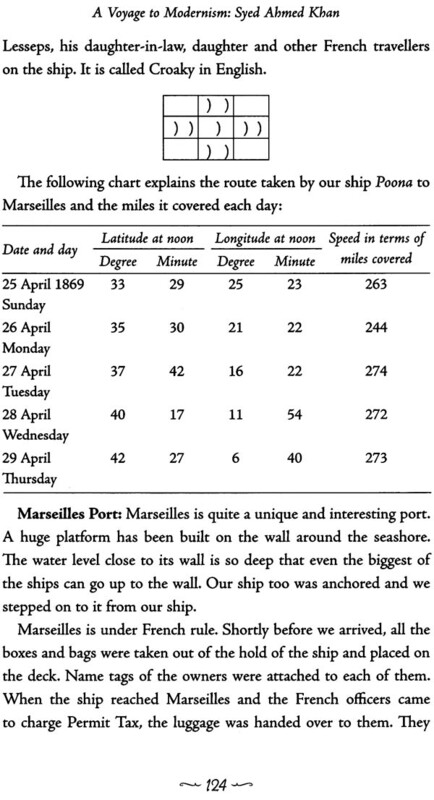 There are not many native gentlemen who, at the age of 52, would undertake the long sea-trip to England, and face the grate change of climate and habits which it involves, wrote Colonel George Farquhar Irving Graham, first commissioned as a military officer but later seconded to the Civil Service of the North-West Provinces. 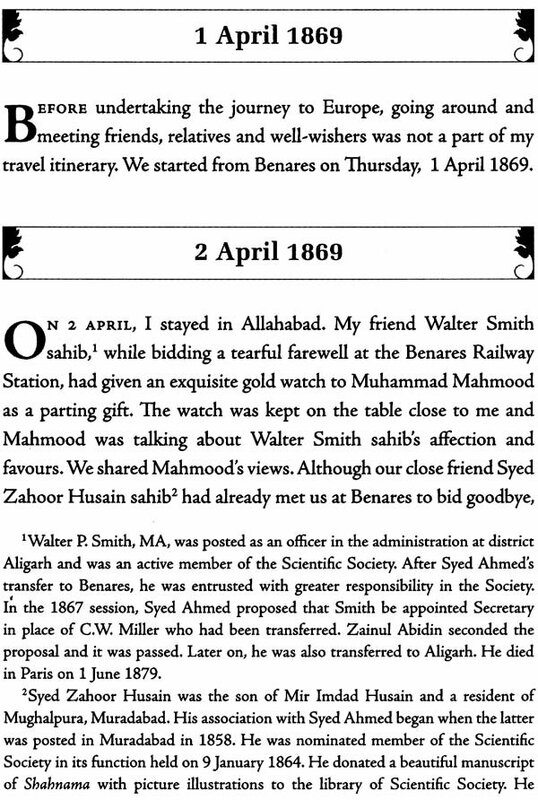 The reference is to what turned out to be the most momentous event in Syed Ahmed’s life—the journey to England with his younger son, Syed Mahmood, who had earned a government scholarship to study in England; his elder son Syed Hamid, who was in the provincial service in North-West Provinces, Mirza Khuda Dad Beg, and his loyal servant, Chhajju. The trip cost Syed Ahmed dearly. He had to sell his library, mortgage his ancestral house, and ask for a grant from the government. The government obliged, first with leave and later with a grant. The small group set out from Benares on 1 April 1869 to reach Bombay on 8 April. On 23 April, they entered Egypt from the architecture of the mosques, which Syed Ahmed compares with the Quwattul-Islam Mosque in Mehrauli, Delhi, he was fascinated by the lighter and less expensive Persian wheel which was used for irrigation. 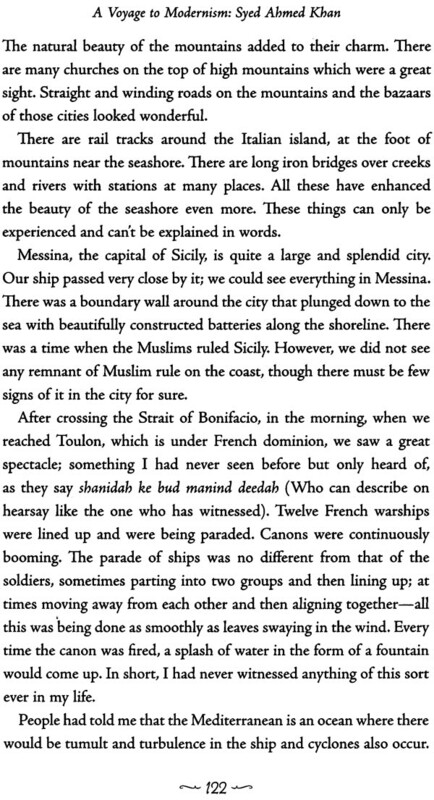 He was, likewise, spellbound by the sights in Marseilles, a city of 300, 131 inhabitants. The train journey from Marseilles gave him a fair idea of the beauty, freshness, and verdure of France. He noticed thousands of acres planted with vines, in the same way as thousands of acres in Fatehgarh and Meerut, or in Ghazipur were planted with roses. Versailles reminded him of the canal in the Delhi Fort, in whose waters he had played as a child; the Mehtab Bagh pond, on the banks of which 360 fountains played of old and the palace and fountains of Deeg in Bharatpur. Comparing the royal palaces in Versailles with the buildings back home, he remarked that, there is nothing to match the lovely Taj and its minarets—that monument of grace had honour to our ancient architecture. The beauties of Marseilles were eclipsed by those in Paris. The Notre Dame Cathedral was captivating, and the pillars, fountains and lovely lakes at the Elysee Palace enthralling. The streets took him back to Chandni Chowk in Delhi, which was at that time bisected by the canal running down its middle, with streets as broad as those in Paris on either side. Syed Ahmed makes no mention of the destruction caused to the area after the British assault in 1857. In London’s intellectual climate, Syed Ahmed found a congenial atmosphere for study and reflection. The city’s architecture impressed him. Sharing the joy of discovering a new world, a world of hope and promise, he appreciated the equality of opportunity available to both sexes; the people’s manners and customs, and the ‘beauty’ and ‘excellence’ of education. 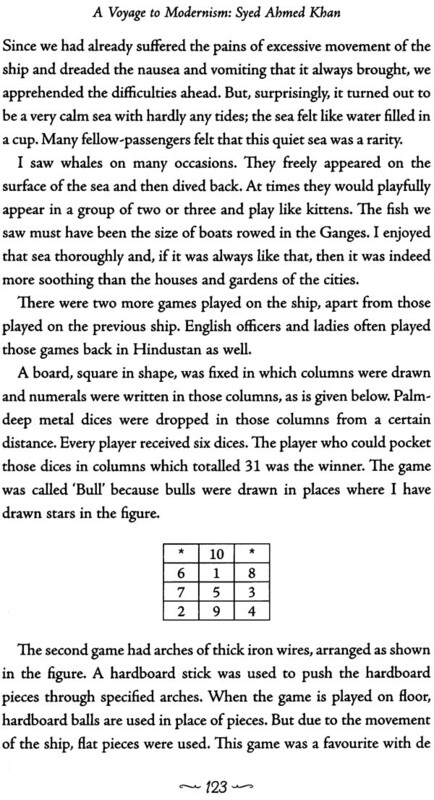 ‘If fellow Indians’, he opined, ‘can only attain to civilization, it will probably, owing to its many excellent natural powers, become, if not the superior, at least the equal of England...’ He visited mansions, museums, engineering works, shipbuilding establishments, gun foundries and vessels of war. 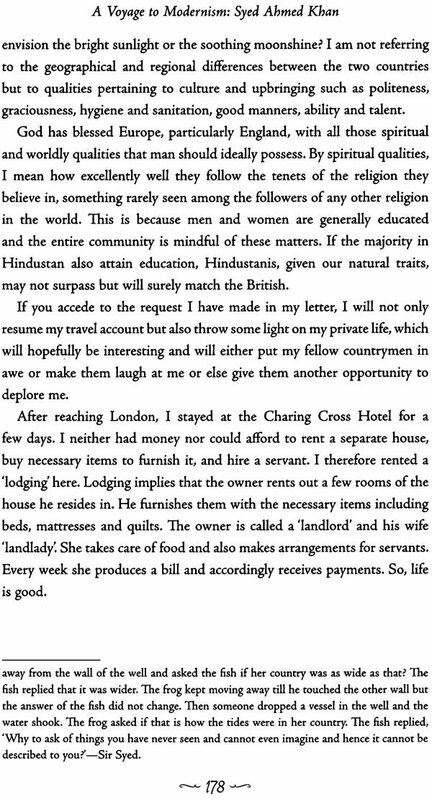 What he saw led him to conclude: ‘All good things, spiritual and worldly which should be found in man, have been bestowed by the Alimghty on Europe, and especially on England.